1. Cut: Cut an 18” x 28¼” (45.5 x 71.5 cm) backing piece from canvas. 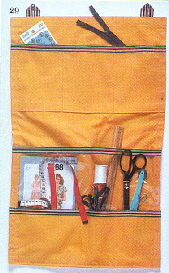 Also, cut one 18” x 7¾” (45.5 x 19.5 cm) pocket and one 18” x 6 3/8” (45.5 x 17 cm) pocket from canvas. Cut three 18” (45.5 cm) and two 1” (38 cm) ribbon lengths. 2. Loops: Fold the short ribbon pieces in half to form a double layer. Edgestitch. Make loops as shown in Sketch 1, stitching across bottom triangle. 3. Prepare Backing: pink top and bottom edges; turn 1¼” (3.2 cm) and press. Pin loops in position at top. See Sketch 2. Edgestitch along both folded edges. Topstitch ¾“ (2 cm) from finished edges. 4. Pockets: Press upper raw edge of canvas pockets ¼” (6 mm) towards right side. Pin ribbon along pressed canvas edges and flush with plastic top edge. Edgestitch both long sides of ribbon. Press under ½” (1.3 cm) at lower canvas pocket edges. Pin and stitch pockets to backing, layering lower canvas pocket over plastic as shown in Sketch 2. 5. Finish: pink side edges. Turn under 1” (2.5 cm) Press. Pin and topstitch 5/8” (1.5 cm) from finished edges. 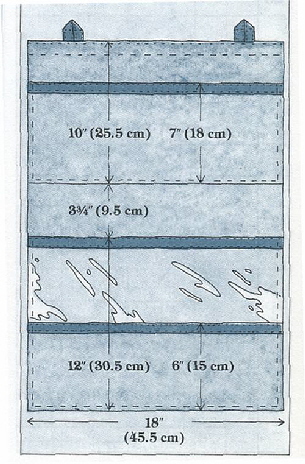 Divide pockets into sections as desired by stitching vertically through all layers.